As part of a collaborative journalism project, Working Narratives, the parent organization of Nation Inside, works with media partners to emerge suppressed community stories. The investigation below is the result of a partnership between Working Narratives and Criminal Legal News. Join the Working Narratives mailing list to stay up to date on this and other Working Narratives efforts aimed at shifting the balance of power and building a more just society. Unbeknownst to college students across the country, their school may be surveilling their social media activity. What may be even more surprising to learn is that even individuals who have no affiliation with a school that’s engaged in this type of surveillance may nevertheless have their social media activity scooped up in the school’s social media surveillance dragnet simply due to their proximity to campus. That’s what happened to Bobby Padgett. He wasn’t a student at East Carolina University (“ECU”). But that didn’t stop him from being monitored and surveilled on social media by the campus’ upper-level administrators and law enforcement unit utilizing a third-party company’s platform to do so. The tweet caught the attention of administrators and law enforcement officers at ECU, who were using a platform named Social Sentinel to monitor key words in public posts on the social media sites Twitter, Facebook, and Instagram. A background check was subsequently done on Padgett, examining who he was, what his political views were, and his ties to ECU (he had none), among other things. “Do we know Bobby Padgett? I don’t think students are thinking/planning a sit in … but BP may be encouraging it,” wrote Virginia Hardy, ECU’s vice chancellor for student affairs, in an email to other administrators in July 2016. Campus law enforcement at ECU also had done research on Padgett and explained more about Padgett’s activist background to their administrative-level colleagues. In essence, both law enforcement and campus administrators created a dossier on him in reaction to a tweet he disseminated, which was detected by Social Sentinel. When all was said and done, nothing came of the ECU probe on Padgett, though. Padgett had simply expressed his political views in a tweet. He was not a campus organizer or leader but merely a voice with passionate views who sent out a tweet about the university’s upper-level brass. And that was enough to ensnare him in a campus law enforcement query at ECU due to its use of Social Sentinel. Padgett, in a comment provided to Criminal Legal News, chocked up the situation to the well-documented conservative political maneuvering by the University of North Carolina System. And yet, Padgett’s story isn’t an isolated incident, by any means. Rather, he was caught up in the ever-expanding surveillance dragnet that’s the result of the ongoing relationship between North Carolina’s law enforcement agencies and public schools within the state, ranging from elementary schools to universities. Increasingly, law enforcement surveillance of students is occurring both on and off campus. Under state and federal case law that’s evolved over the past two decades, this type of dragnet surveillance by law enforcement on social media is perfectly legal [See: Criminal Legal News, Aug. 2018, p. 1], though it occurs at the chagrin of criminal justice reform and constitutional advocacy groups. One such group is Working Narratives, which shared a slew of documents obtained via North Carolina’s open records law with Criminal Legal News, including the one about Padgett. Working Narratives is collaborating with CLN on an ongoing investigation about issues of privately owned social media monitoring companies and policing in education. Those documents show how schools, universities, and their police forces, and law enforcement agencies have contracted with private firms to perform invasive surveillance of social media in areas close to and on K-12 and college campuses. These days – particularly in the aftermath of school shootings – much of that geofencing surveillance is conducted by Social Sentinel, a firm based in Burlington, Vermont, and formerly under the umbrella of the consultancy firm Margolis Healy. That firm has since been bought out by the law firm Cozen O’Connor. Margolis Healy was the namesake of its co-founders, Steven Healy and Gary Margolis, who are the past president of the International Association of Campus Law Enforcement Administrators and the former chief of police at the University of Vermont, respectively. The Cozen O’Connor-owned Margolis Healy also runs the National Center for Campus Public Safety, created in 2013 with a $2.3 million grant from the U.S. Department of Justice, which fell under a grant solicitation program housed within the DOJ’s Bureau of Justice Assistance. The Center for Campus Public Safety’s funding came from the 2013 Congressional budget bill, which included a provision calling for a $2.75 million grant toward the creation of such an entity, a grant process eventually won by Margolis Healy. Effectively, then, Social Sentinel got off the ground, in no small part, with federal taxpayer money. The company, which launched in 2012, said it does not monitor individual students and just tips off school districts about threats. The documents reviewed by Criminal Legal News, however, sometimes show otherwise about how the platform actually works in the field in monitoring individual students and even non- students. Margolis, though – in an interview with Criminal Legal News – denied that the platform can be used to surveil and investigative individual students, such as Padgett. A document obtained via an open records request shows Social Sentinel boasting of its ability to help law enforcement police protests. In a white paper titled, “Demonstrations and Protests: Using Social Media to Gather Intelligence and Respond to Campus Crowds,” Social Sentinel pointed to the platform’s ability to single out individuals fitting in the bad apples camp during protests and demonstrations. The white paper also gives tips directly to law enforcement as to how to best utilize the platform to monitor and police protest actions. More recently, Social Sentinel saw its fortunes boosted with a $3 million grant from the New York City-based investment firm Lerer Hippeau Ventures, which also provides finance capital to the millennial audience-targeted online news outlet BuzzFeed, the progressive social media video news sharing company NowThis, and other startup digital media companies. Kenneth Lerer, one of the firm’s namesakes, served as a co-founder for the progressive news website The Huffington Post, now known as HuffPost. “As one of the leading seed investors in technology, we believe an open, connected and diverse world is a better world. However, we know the growth in public social media has coincided with an explosion of actionable threats of harm to people, places and things. Those charged with ensuring the safety of our communities are looking for a way to address these threats while balancing respect for individual freedom,” Eric Hippeau, managing partner for Lerer Hippeau Ventures, said of the grant in a press release disseminated by Social Sentinel. Lerer Hippeau did not respond to a request for comment for this story, deferring to Social Sentinel. Social Sentinel has landed contracts not only throughout North Carolina, but also across the country, according to a review of news clippings by Criminal Legal News. Prior to going by the name Social Sentinel, the company was known as Campus Sentinel. In 2015, the National Center for Campus Public Safety named Jeff Allison — previously the FBI special adviser for campus public safety — as its strategic partnerships coordinator. Social Sentinel appears extensively in the documents reviewed by Criminal Legal News. But so does the firm Geofeedia, which was all the rage for a few years, but its star descended in 2016 in the aftermath of social media platforms such as Facebook and Instagram, denying the firm access to its API (application programming interface) data, which allowed it to crawl any and all social media posts at any time, in real time. As its name implies, the company had the ability to geofence at nearly any location, live in-action, of most social media user feeds. The U.S. Central Intelligence Agency liked the concept behind the company so much that it invested in it, in fact, via its venture capital wing In-Q-Tel. At its peak, Geofeedia claimed 500 law enforcement agency clients across the country. Geofeedia’s platform and social media monitoring on that platform had been used to surveil high-profile movements globally, such as Black Lives Matter and its Ferguson, Missouri precursor movement; the Arab Spring, Greece’s anti-austerity movement, and others. In fact, Geofeedia had special contractual agreements with Facebook and Instagram API data, obtained via confidential agreements, giving the firm rare access to the companies’ behind-the-scenes engineering data. With that national backdrop, North Carolina’s law enforcement apparatus, too, quickly became fans of Geofeedia. At one point in time, according to documents reviewed by Criminal Legal News, Geofeedia had contracts with the North Carolina State Bureau of Investigation (“SBI”), the North Carolina Information Sharing and Analysis Center (a node of the U.S. Federal Bureau of Intelligence’s and the U.S. Department of Homeland Security’s Fusion Center network), and the Durham County Sheriff’s Department. Put another way, before its fall from grace, the company was a titan of sorts in the state. The documents obtained show that, even though Geofeedia had the technological know-how to do things far more sophisticated, the company also utilized undercover Facebook accounts as a normal part of social-media probes on behalf of law enforcement, according to a 2014 email sent by the company’s then-Director of Strategic Accounts Brandon Filoramo. Geofeedia also came into play in a high profile way in North Carolina in 2014, too, when 350,000 spectators gathered for golf’s U.S. Open in Pinehurst, North Carolina, doing so in tandem with the North Carolina SBI. According to a July 2015 email chain between Durham Police employee Jeffrey Wilking and SBI analyst Nichole Poole, Poole stated that the SBI used social media surveillance to beef up tournament security. Poole further explained via email that, after using Geofeedia on U.S. Open attendees at Pinehurst, the SBI moved onto Black Lives Matter activists. 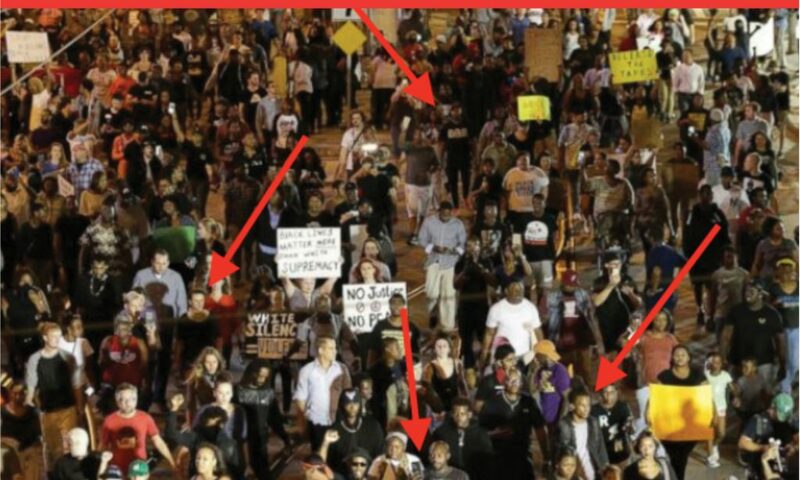 “We have used [Geofeedia] to monitor threats possible during protests especially during the Ferguson incidents, New York incidents and the reactions here in NC, as well,” wrote Poole in her email. The SBI, like most other law enforcement agencies, has since canceled its Geofeedia subscription. But it still partakes in social media surveillance, it said in a statement. “The NC Information Sharing and Analysis Center monitors public information from social media and other open sources surrounding various events across the state in an effort to assist local and state law enforcement officers in protecting the public,” remarked an SBI spokesperson. Although there are other companies in the business of surveilling social media, Social Sentinel has laid stakes in the ground the deepest as the fait accompli future of actionable social media monitoring and surveillance in North Carolina. And far beyond. According to a contract document, ECU signed a one-year contract with Social Sentinel in May 2015 for $14,000. It offers signs that the platform can be abused by law enforcement and campus administrators for surveillance related not only to law enforcement purposes but also for a public relations rationale. In fact, key word search term alerts are the focus of all of the social media monitoring and geofencing companies. It is an aspect that can either greatly limit the scope of law enforcement investigations to matters of public safety or else can expand them into a realm not possible before the advent of social media mass surveillance monitoring tools, such as Social Sentinel. For its part, Social Sentinel says it leans towards the former with regards to the use of key words, but the documents reviewed by Criminal Legal News appear to tell a different story. Even before seeing open records-centric evidence of the company’s deeds in-action, Social Sentinel has been criticized by the libertarian campus free speech advocacy organization, the Foundation for Individual Rights in Education (“FIRE”), for its key words-based approach and how it can potentially lead to abuses. The contract document for Social Sentinel and ECU also notes that the “Gunbrella” incident, which ensued at the ECU campus was partially the inspiration behind paying for Social Sentinel. That incident centered around a student who was seen on camera carrying an umbrella in his backpack which was mistaken by campus law enforcement for an actual gun. The campus was put on lockdown for five hours to solve what ended up being the false alarm investigation. The documents further reveal that, as of August 2015, ECU had 16 staffers working on the Social Sentinel account. They included the deputy chief of police, two investigative officers, the associate dean of students, a media relations staffer, and others. They also show that the university’s upper-level brass knowingly concealed that it had signed a contract with Social Sentinel, saying that doing so could create an uproar on-campus and beyond. ECU did not respond to a request for comment asking that very question. ECU’s former Executive Director of Communications, Public Affairs and Marketing, Mary Schulken, said in a May 2015 email to ECU Associate Vice Chancellor Bill Koch that she saw public relations “reputational” advantages of using Social Sentinel, too. Margolis said his time serving as a campus police chief at the University of Vermont has informed his company’s approach to social media monitoring, saying the company aims to balance campus and school safety against people’s constitutional rights, particularly those embodied in the First and Fourth Amendments. Not everyone was always blindly gung-ho about use of Social Sentinel, however. At least one campus administrator, Associate Dean of Students Travis Lewis, raised legal questions about its use on-campus. The officer asked whether Social Sentinel could be described as an “intercept technology,” which is defined under North Carolina law as something academic institutions are prohibited from using. ECU’s answer as to whether Social Sentinel raised legal red flags, upon review though, was answered in the negative. Social Sentinel general counsel Liz Kleinberg said she spoke with the campus chief technology officer, who told her they do not use intercept technology. The higher-ups at ECU also monitored protestors who were organizing against them. Social media feeds were monitored for mentions of protests against Chancellor Cecil Staton and against University of North Carolina System President Margaret Spellings. “We monitor social media everyday especially when there are threats or safety concerns that may impact our campus. In the event of a protest, we want as much information as possible so we can prepare accordingly to keep our community safe while protecting free speech rights,” ECU’s Bill Koch said in response to questions about ECU’s social media monitoring activities. Despite its potential far reach into the lives of citizens, in an October 2016 email, Officer JD Gregory – who works for the ECU Police Department’s Investigations Unit – critiqued Social Sentinel along the lines of it being a “feel good” apparatus, which allows law enforcement to say it has done its due diligence while doing little to actually halt crime. Gregory said it produces too many search results to render it useful for a busy staff. She questions the effectiveness of first getting an alert based on key words, which will likely yield a wide array of “false positives” and then having to go back and read through all the posts to see if any, in fact, raise red flags. For its part, Social Sentinel has downplayed the concerns raised by the documents, some of which were shared with the company for review. Margolis clarified, though, that the technology remains somewhat similar, but Social Sentinel has gotten better at using it judiciously and effectively. “As you’d expect with any company, like us or any company, we get better and better. We’ve invested time and energy and resources into data science, into our product team, so we can get better and better and better and more efficient and eliminate the false positives,” stated Margolis. While Margolis and Social Sentinel would not comment on anything specifically at ECU found in the documents, he did say the company had looked at the agreements with the school and that the contractual relationship will continue. There’s been a method behind this madness. In the aftermath of school shootings, Social Sentinel has been the most effective company to utilize what reporter and author Naomi Klein has pointed to as the “shock doctrine.” That is, using moments of public crisis to push private sector solutions paid for on the public dime. To date, Social Sentinel has clients in 24 states. And in the aftermath of the Parkland, Florida, high school shooting in February 2018, CEO Margolis went on Fox News to say his company could have prevented the Parkland shooter from doing what he did, which ended in the deaths of 17 people. The company also swooped into town in the aftermath of the August 12, 2017, incident in Charlottesville, Virginia, in which a neo-Nazi fatally plowed his car into Heather Heyer. Many others were wounded in that clash pitting the neo-Nazis against those affiliated with the Antifa cause, shorthand for anti-fascism. In September 2017 – a month after the deadly affair in Charlottesville – Social Sentinel signed an $18,500 contract with the University of Virginia, which is based in Charlottesville. The ACLU of Virginia has expressed concerns about the university signing up with Social Sentinel, telling the The Daily Progress in Charlottesville that it could rope in people innocent of any criminal wrongdoing in law enforcement probes. “This really isn’t the way to find the bad guys, because they’re texting and emailing and using private groups,” ACLU of Virginia spokesman Bill Farrar told The Daily Progress.